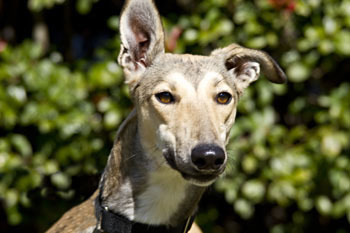 Elsa is an untattooed, fawn female who looks like she's been frosted with black hairs. She is approximately 3 years old. 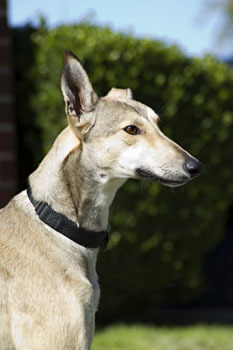 She is one of GALT's Thank Heaven Eleven, who were abandoned in a dog trailer in Witchita Falls in November 2011. 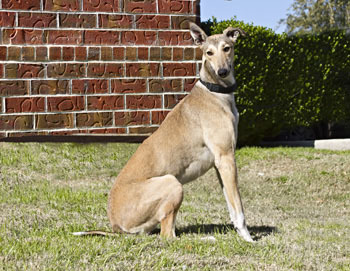 They were taken in by the Wichita Falls shelter, and volunteers brought them to join the GALT family on November 30. This striking girl is not cat tolerant. She is ready to find a home!